Update: Rackspace shuts down Koran-Burning Dove World Outreach Center's Website for "hate-speech." 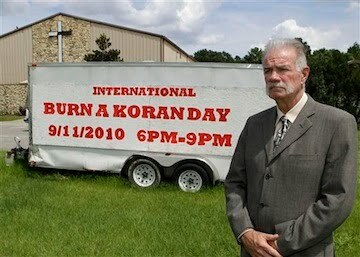 I must join the majority of people condemning the Dove World Outreach Center's planned "International Burn A Koran Day"" scheduled to take place on 9/11. Dove World Outreach Center is a small, 50 member non-denominational charismatic Christian church in Gainesville, Florida, United States, led by Terry Jones and his wife, Sylvia. The church gained some notice in the late 2000s for its displays of anti-Islam messages. It received widespread national and international attention in 2010 after it announced that church members would hold book burnings of the Qu'ran on the ninth anniversary of the September 11 attacks, a day it called "International Burn a Koran Day". U.S. President Barack Obama called the planned burnings a "destructive act", that would be "a recruitment bonanza for Al Qaeda", and could result in serious violence against American troops. Even his own church condemn's the Qa'ran burning! Albeit a small group of "Christians" promoting what many consider an act of ignorance, hatred, bigotry, and intolerance, it does serve to highlight the extremist nature of some groups within both Christianity and Islam. I enter this debate with much trepidation since the "corporate media" is pushing this story and the stories about illegal immigration and of course, the "Ground Zero Mosque" to foment civil unrest fueled by racism, intolerance, hate and bigotry thus allowing the global elites to further cement their plan to establish a global scientific dictatorship, as discussed in a recent article, Divide and Rule. Consider, also, similar attempts by the global elites to use manufactured "global warming" hysteria in order to establish a global "carbon tax" thereby providing both the "financial" and "regulatory" means to control the population of the entire world (Climate Change: A Failed Attempt To Establish "Scientific Dictatorship"). Paul Joseph Watson's article, UN Blueprint: Dismantle Middle Class, Build World Government, posted today at InfoWars.com, makes the case that "A UN blueprint for putting the organization back at the forefront of global governance alarmingly reveals the agenda to re-brand global warming as “overpopulation” as a means of dismantling the middle classes while using “global redistribution of wealth” and increased immigration to reinvigorate the pursuit of a one world government". A key component of the planned establishment of a "global scientific dictatorship" is the implementation of the "police state" grid. Kurt Nimmo's article, FBI Warns of Possible Terrorist Response to “Burn Koran Day” explains the U.S. Government's long history of direct involvement in terrorist actions evoking a perceived need to further expand the "national security" apparatus, thereby eroding what remains of our civil liberties and freedom. In the highly charged atmosphere following the so-called Ground Zero Mosque incident, any violence in Florida or elsewhere in the United States will certainly feed the government propaganda machine that incessantly cranks out warnings of Islamic terror. If terror occurs this week, it will certainly be exploited by the corporate media and the government to further the bogus war on terror, bulwark imperial designs in Afghanistan, Iraq, and Pakistan, and provide impetus to finish the police state control grid in America. Gerald Celente, noted trends researcher with the Trends Research Institute, appearing on The Alex Jones Show, "Calls Out General Patraeus On Koran Warning Hypocrisy". You can many articles and books exposing the deliberate attempt by the global elites to use events such as the "International Burn A Koran Day", the "Ground Zero Mosque Debate", "Illegal Immigration", "Climate Change" and more to establish global government. Regardless, the actions of Dr. Jones is unacceptable. Is Dr. Terry Jones simply misguided? I only pray, with little hope of success, that he will wake up before it's too late; only to realize that he and his followers are considered most like the people whose actions they condemn. The failure of wisdom in this case is rather apparent. I had the opportunity to speak with a representative at Dr. Jones' church yesterday who identified herself as Fran.. During my brief conversation with Fran, I asked if Dr. Jones would reconsider his decision to hold an "International Burn a Koran Day" (of course, I realize that more important people than me had already broached this subject with him). As expected, Fran stated that they had considered all options and listened to many views on the subject, but remain steadfast in their decision to do what "God Told Us To Do". When I attempted an appeal to reason with Fran, she abruptly ended the conversation, reiterating the fact that they are doing what God told them to do. Do Terry Jones' claims concerning Radical Islam have any merit? Does the Holy Book of Islam, the Qa'ran, promote violence? Is Islam both a religion and a political organization? I am not qualified to fully answer these questions, but I will say that Dr. Jones goes much further than simply denouncing radicals within Islam, he denounces the Religion as radical, taking exception to any claims that he is against "the people" who are deceived by their Religion. The main problem with Dr. Jones' argument is that his decision to burn the Qa'ran exemplifies exactly that which he claims to oppose; radical, extremist actions by an individual who fails to listen as the world condemns his actions. Emboldened by "knowledge" about an opposing Religion but lacking the wisdom to put the knowledge to effective purpose, he has set sail upon the shores of America's few remaining freedoms with a focus on nothing more than self aggrandizement, fear, hatred, and intolerance feeding into the global elites' plan for the world. As a result, Dr. Jones and his followers have lost any credibility as a legitimate Christian organization with "legitimate concerns" about the threat posed by Islam. Regardless, such a small group doesn't garner much credibility anyway. Please wake up, Dr. Jones! We need real people to lead a real revolution in this world. A revolution for peace, love, and honesty that will change the course of time from a path of enslavement to a path of freedom. The following article provides further details about the overwhelming number of people who have condemned Dr. Jones for his decision to move forward with his planned burning.